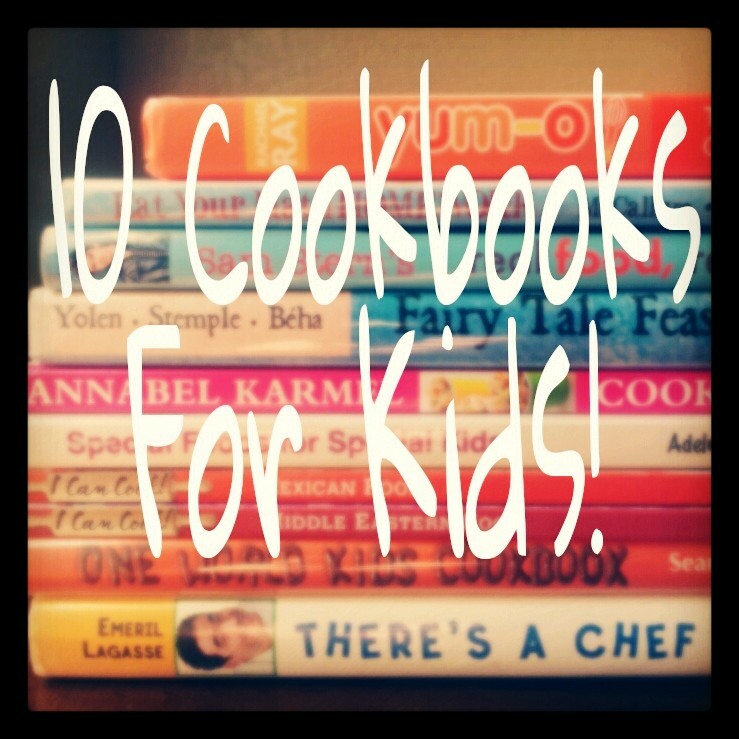 Today, as part of the Kids in the Kitchen series, I am sharing some of my favorite kid friendly cookbooks. These cookbooks are geared towards kids and I love them because they are fun, informative, educational and have tons of recipes that kids will absolutely love to gobble up! Many of these cookbooks can be found at new and used book stores, as well as on line and at most public libraries. They make for great summer reading and can provide for hours of entertainment, and would also make for great birthday or holiday gifts for a young budding chefs of all ages! 1. Better Homes and Gardens New Junior CookBook (by Better Homes and Garden): This cookbook is classic and has educated aspiring young chefs for decades (the first edition was published in 1955). One of the several editions of this cookbook was actually MY first cookbook way back when and it is still one of my favorite cookbooks for kids. The most current edition is full of bright colored photos and fun cartoon characters. The New Junior Cookbook teaches kids how to read and prepare a recipe, how to properly measure different ingredients, eat balanced meals, kitchen and food safety and different kitchen terms. Each recipe has the ingredients and tools listed separately from the step by step directions, nutritional information, dietary exchanges, and full color photos of the completed recipes. Recipes include breakfast, lunch, dinner, snacks, desserts, party food and cater to different cooking abilities. 2. How Cooking Works (by DK Publishing): This cookbook is chock full of color photos! There is a section with common kitchen tools with a color photo of each tool and then each recipe has multiple step-by-step color photos of kids preparing the recipe. All recipe directions are written exclusively for kids, with icons indicating when adult help is needed. Recipes also include a list of tools needed, as well as prep and cook times and number of servings. This cookbook contains a special ‘how cooking works’ fact box for each recipe answering common kid cooking questions like, “Why do shrimp become pink when cooked?” and “Why do pancakes bubble when they cook?” Recipes include breakfast, meals, snacks and dessert. Most of the recipes are ‘basic’ and then give multiple examples of variations to change up the original basic recipe. 3. Willams-Sonoma – The Cookbook for Kids: Great Recipes for Kids Who Love to Cook (by Lisa Atwood): This cookbook contains helpful information with cartoon images of common kitchen tools, basic cooking tips and techniques, and a glossary of common cooking terms. The Cookbook for Kids contains recipes for breakfast, lunch, snacks and sweets. Each recipe has the ingredient listed separately from the directions and has measurements listed in cups and ounces/grams. Every recipe contains a ‘fun food fact” that is relevant to the recipe and is found clearly marked on the recipe in a colorful food graphic. Most of the recipes have beautiful full color photos of the completed recipe. 4. Fairy Tale Feasts: A Literary Cookbook for Young Readers and Eaters (by Jane Yolen and Heidi E. Y. Stemple): While this cookbook does not focus so much on cooking techniques (like other kids cookbooks), it is a fantastic kids cookbook! Fairy Tale Feasts is a beautifully illustrated book. It contains classic fairy tales (in short story format) and a recipe inspired by the fairy tale (you know like the Read It, Eat It series I have). Some of the fun fairy tale/recipe combinations include The Little Mermaid with Seaweed (spinach) Stuffed Shells and Cinderella with Pumpkin Tarlets. Each fair tale contains notes as to where the fairy tale originated or different versions of the fairy tale from around the world. Recipes include an equipment list and a fun fact section about the ingredients in the recipe or a history of the recipe. 5. I Can Cook! Series (by Wendy Blaxland): This is a fantastic series of cookbooks. Each book in the series focuses on a different cuisine from around the world; from American to French, Chinese, Italian, Middle Eastern and Mexican food. While compared to other kids cookbooks, every cookbook in this series only contains a handful of recipes (approximately 10), however each book is packed full of information! Each book really focuses on each cuisine with color maps of the region highlighted in each book, giving information about where different ingredients are grown in each region, as well as giving definitions of these specific ingredients, cooking terms, etc. common to each region. The cookbooks contain authentic recipes and have step-by-step illustrations, as well as a full color picture of the completed recipe. The book also highlights the cultures and has corresponding color photography; and teaches about basic cooking terms and techniques. 6. Yum-o! The Family Cookbook (by Rachael Ray): This cookbook really is for the whole family! Recipe chapters highlight breakfast, snacks, lunch box ideas, dinner and a whole section of meals where leftovers can be easily rolled into a whole new meal. Each recipe includes specific notes of what “The Itty Bitties Can Do.” Other special features include “Kid 2 Kid” recipes, recipes written by kids for kids, special ‘articles’ ranging in topics from “10 Whole Grain Foods to Try” to “Tips for Picky Eaters.” Almost every recipe has a full color photo of the completed recipe, kids cooking or cartoon caricatures of Rachael or her dog. 7. Eat Your Math Homework: Recipes for Hungry Minds (by Ann McCallum and Leeza Hernandez): This is the perfect cookbook for kids that think they hate math! This cookbook teaches kids common math facts and terms, such as fractions, shapes, Pi, probability, etc. Each math term is introduced with definitions and cartoon illustrations and then has a corresponding recipe. Recipes list prep, cooking and total time, as well as number of servings, difficulty and tools needed. Each recipe and lesson is very hands on and includes fun illustrations. Eat Your Math Homework also contains a glossary of math terminology, a review section, as well as kitchen tips. This cookbook is probably best for older children. 8. Emeril’s There’s a Chef in My Soup! Recipes for the Kid in Everyone (by Emeril Lagasse): This cookbook is very thorough and detailed in explaining cooking terminology and procedures to kids. Detailed explanations on how to be prepared, work cleanly, and illustrations of how to properly measure, chop, roll dough, crack eggs etc. There is also an illustrated guide to common kitchen tools and a chart of measurement equivalents. Each recipe lists the ingredients and tools separately and have a few illustrations. Recipes also contain colored ‘caution’ icons at the top of each recipe indicating when recipes require a sharp knife, using an appliance, or a hot object. Recipes include a brief forward by Emeril and most of the recipes include a side note with suggestions on what to serve with it, how to make a variation or a fun fact. This cookbook is huge and loaded with a variety of recipes. 9. Special Foods for Special kids: Practical Solutions and Great Recipes for Children (by Todd Adelman): This cookbook is actually geared towards parents but is a great tool if you have a child with food allergies. The first two chapters of the book have useful information for parents about cooking for kids with allergies, signs to look for that might indicate your child has an allergy, tips for making sure your child eats a well balanced diet and more. Each recipe is clearly written (perfect for cooking with kids) and have symbols to indicate if the recipe is already gluten free, dairy free, etc. or if there is an adjustment needed for the recipe to accommodate an allergy. If there is an adjustment needed, it is clearly indicated with detailed substitutions and directions. Recipes also include nutritional information and serving suggestions or recipe variations. 10. One World Kids Cookbook: Easy, Healthy, and Affordable Family Meals (by Sean Mendez and Ferran Adrià): This is another highly educational cookbook! This cookbook highlights over 15 countries from around the world and the food they eat. Each country is represented with photos of landmarks and locals, as well as a map of the world with each country marked, a picture of the country’s flag and information about popular food and traditions from each country. After each country overview, there is an authentic recipe from that country with step-by-step color photos of children preparing the recipe. Disclosure: All photos, except for the first photo, are from Amazon. This post may contain Amazon affiliate links but in no other way is sponsored.